Expert Quality, interchangable, VDE torque screwdriver kit, essential for professional electricians. Perfectly designed for torque-controlled tightening of screws, helping avoid damage to tools, screws, fixings and circuit boards. One of the main advantages of the VDE interchangeable torque screwdriver kit, is the precision torque control. This feature is crucial when you’re working on switchgear and consumer units, helping alleviate the risk of damaging terminals, arcing circuits, or hot spotting, however, more importantly it stops you under or over-tightening terminal screws and breaking the latest Wiring Regulations. Each calibrated torque screwdriver ensures precise, easy adjustment between 1.0 – 5.0 Nm and is fitted with a comfortable ergonomic soft-grip handle. 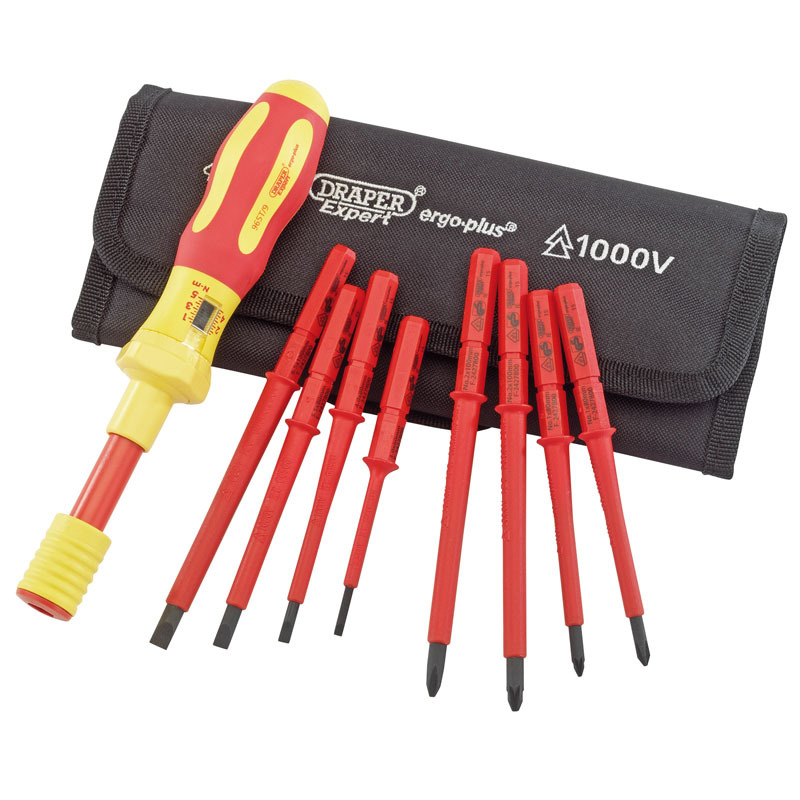 The torque screwdriver is fully insulated, permitting use on circuits up to 1000V AC, and 1500V DC, and it’s reassuring to know, that each and every screwdriver is thoroughly tested to meet the strict safety and accuracy requirements of the VDE, GS, and EN60900 standards. Its comfortable soft grip handle not only prevents your hand from slipping, it’s also resistant to chemicals, oils and most solvents. The VDE interchangeable blades are made from SVCM steel for added strength and deliver a fast, easy, lock and release method into the torque screwdriver, ensuring a safe and secure connection and while also individually tested to 10,000V and fully compliant to EN60900:2012 standards. Each kit contains a torque screwdriver, calibration certificate, 8 interchangeable blades and a storage roll for secure transportation. Aimed at professional electricians where the need for precise electrical installations is necessary.